Image caption There are many different types of dementia. Alzheimer's is the most common form. Dementia, including Alzheimer's disease, has overtaken heart disease as the leading cause of death in England and Wales, latest figures reveal. Last year, more than 61,000 people died of dementia - 11.6% of all recorded deaths. The Office for National Statistics says the change is largely due to an ageing population. People are living for longer and deaths from some other causes, including heart disease, have gone down. Also, doctors have got better at diagnosing dementia and the condition is now given more weight on death certificates. 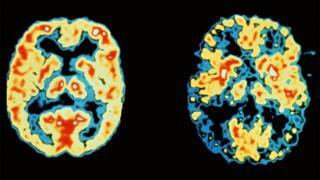 How can we keep Alzheimer's at bay? The bulk of the dementia deaths seen were among women - 41,283, compared to 20,403 dementia deaths in men in 2015. Dementia, including Alzheimer's disease, accounted for 15.2% of all female deaths, up from 13.4% in 2014. For men, however, heart disease remained the leading cause of death in 2015. All types of cancer as a group was still the most common cause of death overall. In the youngest age group, aged five to 19, suicide was the leading cause of death. Among women aged 35 to 49, breast cancer was the biggest killer. Hilary Evans of Alzheimer's Research UK said: "These figures once again call attention to the uncomfortable reality that currently, no-one survives a diagnosis of dementia. "Dementia is not an inevitable part of ageing, it's caused by diseases that can be fought through research, and we must bring all our efforts to bear on what is now our greatest medical challenge." Martina Kane of the Alzheimer's Society said: "It is essential that people have access to the right support and services to help them live well with dementia and that research into better care, treatments and eventually a cure remain high on the agenda." There are around 850,000 people living with dementia in the UK. Linda Trueman, 67 and from Hertfordshire, lost her mother, father and grandmother to dementia. She says attitudes about the disease have changed, but some taboos remain. "It was the 1970s when my grandmother died from dementia and really, at that time, most people didn't know the term Alzheimer's. "And when my father died in 1987 there were several instances where I was explaining to the doctors about his Alzheimer's. "Since then there's been a big change in knowledge and expertise. My mother died from dementia last Christmas and I was really impressed with the level of care she received. It was really touching and respectful the way she was treated. "But it's still a condition that everyone is frightened of. People can find it difficult to be around those with dementia. I understand that. It can be really difficult to handle, particularly if they behave badly in public. But it's the disease, not the person."